This is the default type for all the members. If you are not using "static" keyword while the declaration of a field / property or a method, then it can be called as "Non-static member". The main feature of non-static member is - it will be bounded with the object only. Non-static Fields / Properties : The memory will be allocated, when an object is created. Non-static Methods : These methods can implement operations on non-static fields and properties. If you are using "static" keyword while the declaration of a field / property or a method, then it can be called as "Static member". The main feature of non-static member is - it will not be bounded with the any object. It is individually accessible with the class name. In other words, the static members are accessible directly, without even creating one object also. 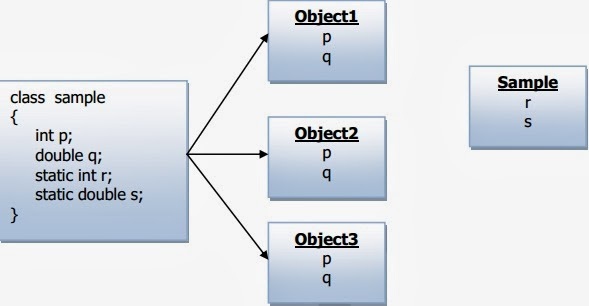 Static Fields / Properties : The memory will be allocated individually, without any relation with the object. 0 Komentar untuk "C#.NET : Static Member"